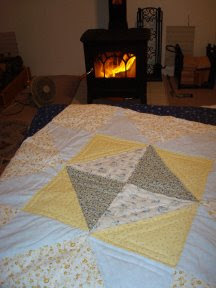 No ball dropping or fireworks, my eve of 2009 was spent quietly in front of the wood stove, quilting. This is an old lap quilt I have been working on for eons. It was pieced and basted together right before we announced our wedding plans, which pretty much put an end to any and all projects I had going at that time except for that of sewing my wedding dress. The pattern is called variable star. Unfortunately you can't really see the border in this picture. Recently, I thought about skipping the hand quilting and just knocking it out by machine quilting it, just to get it done and out of the way. Yes, I do get tired of seeing it hanging around! The thing is, hand quilting is fast becoming such a lost art that I kind of feel like if you can hand quilt, then you should. I know of talented life-long quilters who are well into their eighth decade of life and can no longer quilt because they have lost some vision and hand usage. Perhaps the last, generation of talented quilters are soon to be lost. For some reason, many of these lady's daughters and granddaughters have neglected to show interest in learning the art of quilting. 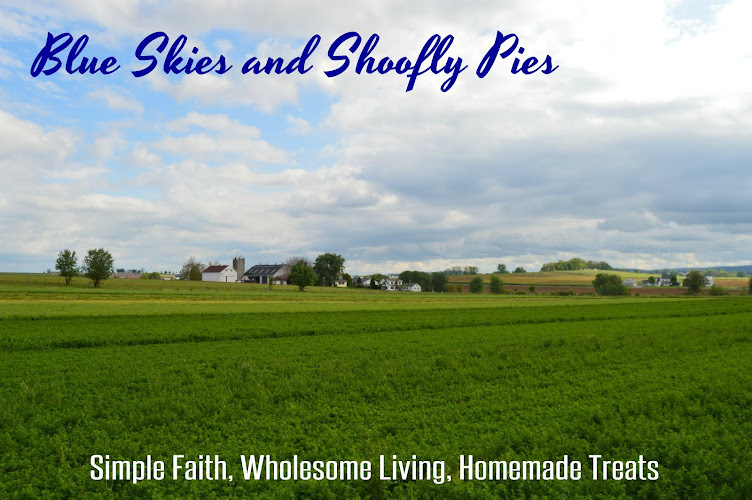 The days of Mennonite women huddled around a quilting frame are fading fast. Last year I visited a newly opened quilt shop and was shocked to discover that no one, not the owners nor customers, knew how to hand quilt. The entire shop was set up for machine quilters. One of the owners told me that there is still some hand quilting still going on "out in Lancaster." The person said it as if they had discovered a lost tribe worthy of a National Geographic documentary. I felt like telling him, "Not for much longer! You better get out there and see it while you still can!" The mild temperatures I had become accustomed to the past month (sixty degrees on Christmas day!) have left us and the cold has settled in, snowflakes and all. We have been having problems with that ancient oil tank again, and are relying solely on our wood stove until the repairman comes. My husband fooled around with the furnace for a couple days before giving in and calling. The wood stove is nice, but only heats the front of the house adequately. On the Table: We'll be keeping warm at supper with some french onion soup and veggie pizza with sausage. Around the Home: The calender controversy. Each year I select a lovely wall calender to hang in a high-traffic area of our home for the purpose of being our "main calender" where we can write down due dates for bills, birthdays, etc. as well as work schedules. When my husband went to put up the calender we selected a couple months ago (containing lovely photographs of Switzerland) we discovered that the calender was made almost solely to focus on the photographs, with just a tiny, itty-bitty calender tucked in a corner of each page. It was not functional at all. Sigh. I can be a bit particular about wall calenders, and have maintained that if I have to look at it everyday, then I have to love it. But so soon after Christmas, calenders were practically sold out everywhere, not to mention expensive if there were any left. And so it came to pass that a free calender from "Butch's Gun Shop" will adorn our wall as the main calender for the next twelve months. At least it has nice paintings of wildlife, even though the intention is that the pictures are supposed to make you want to shoot at the ducks, deer, or whatever. Happy New Year to all of my dear readers, and please know that I am thankful for each and every one of you who take the time to stop by my blog and have a visit. May God bless you all in 2009. The older ladies of our church are trying to teach some of the younger ones. The "younger" ones being in their 40's. I am by no means an accomplished quilter either, and find that making time for it is the most challenging thing. So glad to hear that some of the ladies are trying to pass on their craft. It makes my day, a little! I've been wanting to participate in their sewing, as they also do simple tying, but I homeschool and have only gone once. Lordwilling, there will be the stage in life where I can help out. I have one comfort here if I have a chance to work on it. The thing for my mother is a real big project for me. It is only my second try at embroidery and I want to cut and piece it all together. It really is an undertaking, but it is something I really want to do for my mom. She's been real sick and so I do not know how much time I have left, so that she can enjoy it. If things get too bad, I may employ the help of others. I love the quilt! Aren't you glad it is finally done?? I am lkike you, I hate those prijects laying around. My mother and I quilted a small lap quilt when I was younger. Can't say that I am experienced in it, but I could do it if I had to. I tried to machine quilt one quilt and hated it. I have hand quilted since I first learned how. I have to chuckle though. I still have a fence rail quilt that I pieced a couple of years ago and began hand quilting in my closet. Maybe it's time to pull it out and finish it. You have inspired me. Hi Monica nice lap quilt now that looks like u have it on a quilt stand does it roll up? Great job and a Happy New Year to you.. I love the color! Is that black with the pale yellow? BATMom- It's actually different shades of blue and yellow. The one that looks black is navy blue.